Designed to continuously measure specific conductivity, resistivity, and salinity of a solution, the 7100 Conductivity Transmitter is a highly accurate transmitter for conductivity measurement in the pharmaceutical, power, semi-conductor, and high-purity water markets. The system is offered in four- and two-wire versions, and HART Communication is available. All transmitter functions are accessible through the front panel keypad. 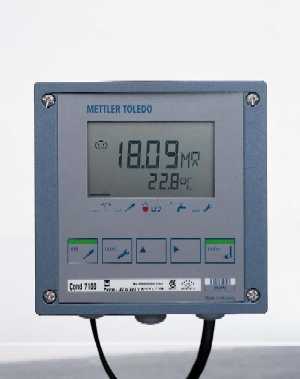 The easy-to-read LCD allows users to view data quickly using intuitive symbols and menus. The company's diagnostic software continuously monitors the conductivity sensor to assure reliability in measurement. An automatic instrument self-test also runs in the background at fixed intervals and checks the memory and transmission of the measured values. Any sensor or instrument defect is shown on the display and triggers an alarm. This unit features pre-programmed USP24 alarms and meets guidelines for pharmaceutical grade water monitoring and ultra-pure water measurements. Its rugged design is FM approved and can be used in nonincendive Class I, Division 2 installations. The two-wire intrinsically safe version can be used in hazardous areas.